Who didn’t grow up on PB&J’s with the crusts cut off and a package of Lay’s on the side? This sandwich sidekick of our youth still conjures up great moments of nostalgia, but can it hold up to grown up taste buds today? Back then, key competitors were Pringles, Ruffles and maybe a Sour Cream and Onion riff, but today there are truly contenders that knock the potato chip thing out of the park. Using high-quality American grown non-GMO potatoes, olive oil and sea salt, Boulder Canyon is one of them. That’s why I figured it was the perfect chip to take Lay’s to task. I’ve picked apart these potato chips in a side-by-side comparison. While they taste similar, their texture is noticeably distinct and nutritionally speaking there are some remarkable differences. How Do Boulder Canyon Olive Oil Kettle Chips and Classic Lays Potato Chips Compare? Surprisingly, both brands of potato chips get all of their flavor from just 3 ingredients. That said, Boulder Canyon ingredients are Non-GMO Project verified. Lay’s are not. Another big difference is that Boulder Canyon uses olive oil in the cooking process and Lay’s are fried in vegetable oil–more specifically sunflower, corn and/or canola oil. Not only does this affect the taste, but this changes nutritional values significantly. One very interesting thing to note before you even start with this fabulous little chart below. I based these numbers on a 1.5 ounce serving, which is what is in my bag of Boulder Canyon Olive Oil Kettle Chips. Lays come in a 1 and 7/8 ounce bag, which is what they call a serving (well, duh, no one shares one of those bags unless their parents make them!). But here’s the kicker, on a multi-serving bag, Lays give their nutritional info for a 1 ounce serving. So what’s your idea of a proper serving Frito-lay? Fortunately, I’ve got a handy dandy calculator and multiplied Lay’s 1 ounce serving nutritional analysis by 1.5 to get a fair comparison. Some of the highlights to note are: Lays are higher in calories, fat and saturated fat. They’ve also got a heck of a lot more salt per serving. I’m guessing the olive oil in the Boulder Canyon Potato Chips are responsible for keeping fat (particularly saturated fat) down and flavor at its peak, so less salt is necessary. Note the majority of Boulder Canyon’s fat comes from monounsaturated fats, which are deemed “good fats” in the world of nutrition. Monounsaturated fats are said to be good for heart health, hair and skin and even the ol’ noggin. So let’s see which looks like a smarter chip purchase? Sodium 180 mg 255 mg. When you look at the two types of chips you can see a difference right away. I’ll be honest, both look appetizing in their own way. That said, Lay’s are paler and more delicate looking. Boulder Canyon kettle cooked chips have a less uniform look and are darker in color so that they look like they’ve been cooked for longer. The first thing you notice when biting into each chip is that they have a different crunch. Lay’s has a light crispiness to it, while Boulder Canyon potato chips have a heftier crunch. It’s unclear whether Boulder chips are actually cut thicker than Lay’s, but they sure feel like they are when you chomp into them. In fact, I wouldn’t be surprised if Boulder Canyon chips were indeed slightly thicker than Lay’s because they actually have a more potatoey flavor. This added depth in flavor could also be from the olive oil and sea salt. Lay’s have a much saltier flavor that lacks in dimension and real potato taste. Of course, both are oddly addictive (as salty snacks often are), but for the true potato chip aficionado, Boulder Canyon Potato chips have that hand-crafted appeal that comes from small batch cooking. The winner: Boulder Canyon Olive Oil Kettle Chips. That’s why they’re in our February Love With Food Box. 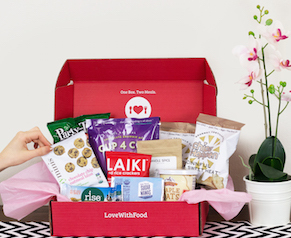 Buy yours today or sign up for a subscription and you’ll get all of our favorite foods delivered to your doorstep every month. Let us know in the comments below if you’re still a diehard Lay’s lover or you’ve hopped on the Boulder Canyon bandwagon. 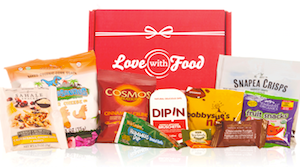 Spice Up Your Life: What’s in the September Box?